PDRC spokesman Aekkanat Promphan said on Friday that there was no way that protesters could get into the Labour Ministry’s building and climb up to the rooftop unnoticed whereas all the police were deployed at the centre to prevent protesters from breaking in. He added that he would like to know whether Chalerm was aware of the presence of the “men in black” or not as their presence coincided with the clashes between police and protesters in front of the youth centre and the dead victims were shot from a high ground. Thaksin Shinawatra's regime had deployed gunmen clearly visible and photographed extensively atop buildings overlooking the clashes. Some were clearly identifiable as police, while others wore tactical gear and face masks typical of clandestine police special operations. 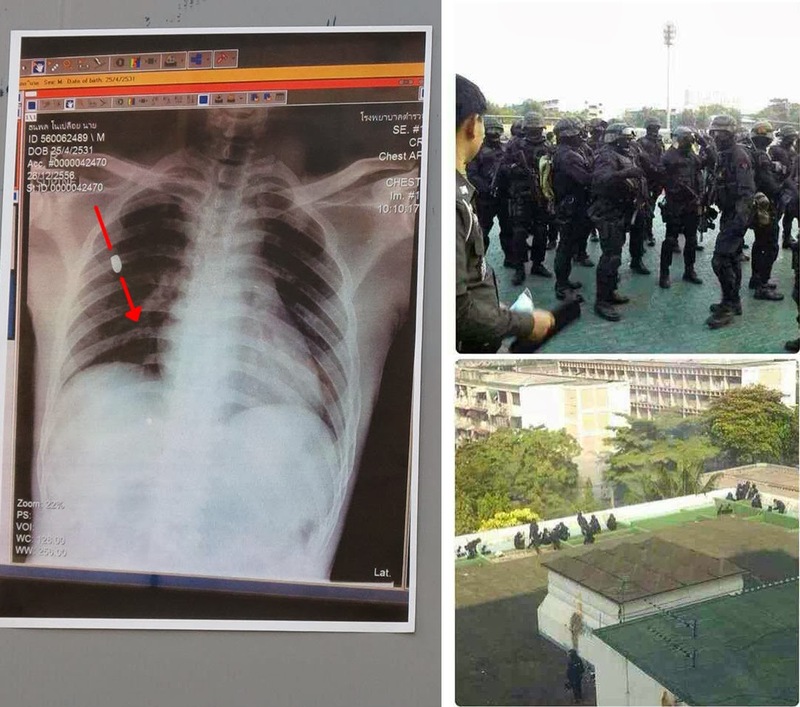 Image: (Left) The chest x-ray of Police Sergeant Major Narong Pitisit used by the regime itself as evidence he was shot "by protesters" - instead, reveals a bullet fired from above where regime police, alongside unidentified gunmen, were positioned. (Right) Regime police and gunmen were clearly visible and extensively photographed (and video taped) atop buildings overlooking the clashes on December 26, 2013. Bullets fired at both protesters and police from above were most likely fired by these gunmen. Video: Drone footage shows that the Labour Ministry building was the only structure with gunmen on top - corresponding with the above referenced photographs. Police vans can clearly be seen surrounding the building and black-clad men can be seen running back and forth across the roof, along with a large group of men crouched down near the edge. Forensic evidence has proven the dead policeman the regime claims was killed by protesters was instead fired upon from above. The regime has attempted to disavow any knowledge of the gunmen, suggesting they were deployed by the protesters despite the building they were atop being clearly under the regime's control throughout the clashes. Thaksin Shinawatra's secret "black shirt" force of provocateurs, mostly made up of navy SEALS and marines, is back on the streets again for the first time since May 2010 and has infiltrated Suthep's rabble. If protests escalate they will seek to incite deadly violence ahead of King Bhumibol's birthday to discredit Suthep and his movement for good. 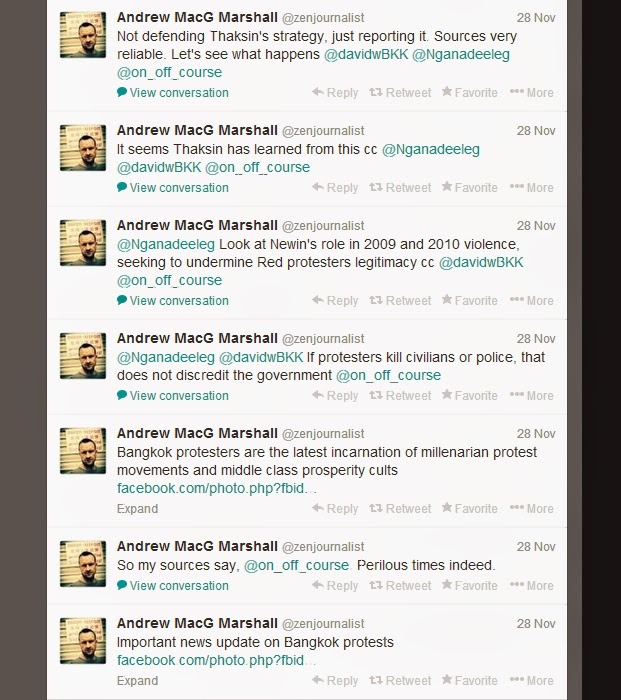 Marshall claims that a "very reliable source" had passed this information onto him, and assured fellow regime supporters that "if protesters kill civilians or police, that does not discredit the government." Image: Screen grab taken of Marshall's Facebook link containing the leaked regime conspiracy to kill in the name of the protesters, as well as assurances that his sources are "very reliable," and that the plan would not discredit the government. It is unlikely any serious investigation will be made regarding the untimely death of Police Sergeant Major Narong Pitisit. However, the fact that the regime seems to have planned such a tragedy ahead of time, has surely capitalized on it since, with the bullet being confirmed to have been fired from above, and the only gunmen known to be located in elevated positions were deployed by the regime, it appears indeed that the regime itself stands as the primary suspect.